Coconut water or juice is the sweet-tasting, clear liquid that comes from the inside of a coconut. The younger and greener the coconut, the more water or juice it holds. Coconut water contains vital vitamins and minerals and, according to the website Home Remedies Web, has many antibacterial, anti-inflammatory and antiviral properties. This makes coconut juice a powerful health elixir. Drinking coconut water can be an effective way to rehydrate and re-balance your body, relieve dry and itchy skin as well as other skin conditions, and improve overall heart health. Some athletes and exercise enthusiasts use coconut water as a natural sports drink. 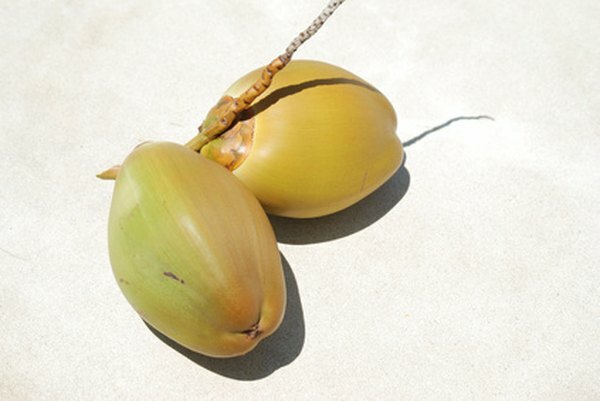 Cocotap.com claims that, due to coconut water's high amount of potassium and other minerals, it is a better way to replenish the body's electrolytes than any other commercial sports drink on the market. Cocotap also states that, since coconut water is a tonic for re-hydration, it may treat conditions such as diarrhea, stomach flu and dysentery. Coconut water contains cytokinins and lauric acid, which are two substances known to help with anti-aging. HomeRemediesWeb.com suggests that topical application of coconut water to the skin can help with wrinkles, age spots, acne and even eczema. Drinking coconut water daily, as reported by ForeverLookinGood.com, may also reduce wrinkles and improve the elasticity of the skin from the inside out. Drinking coconut water may improve heart health. Many people who suffer from high blood pressure or other cardiovascular issues, such as high cholesterol, also have low potassium levels. Since coconut water has an excellent source of potassium, as well as other important nutrients, it is a natural way to lower blood pressure and increase HDL cholesterol levels.